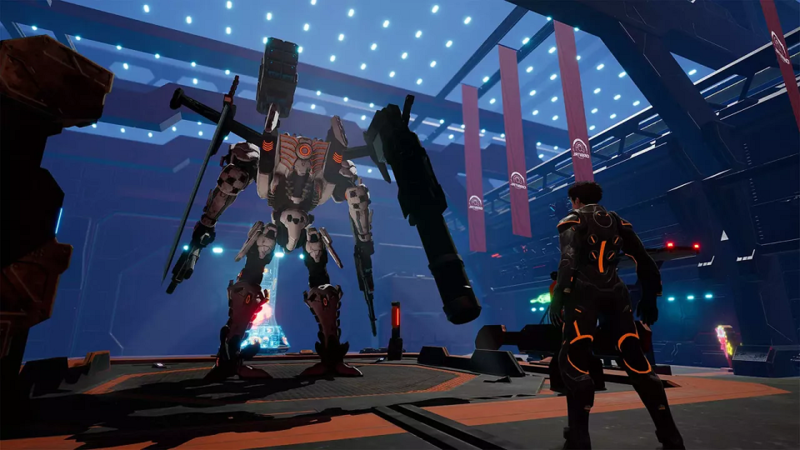 Daemon X Machina was announced during Nintendo’s Direct, but you may have missed the details from the Treehouse Live segment. We watched it so you don’t have to. 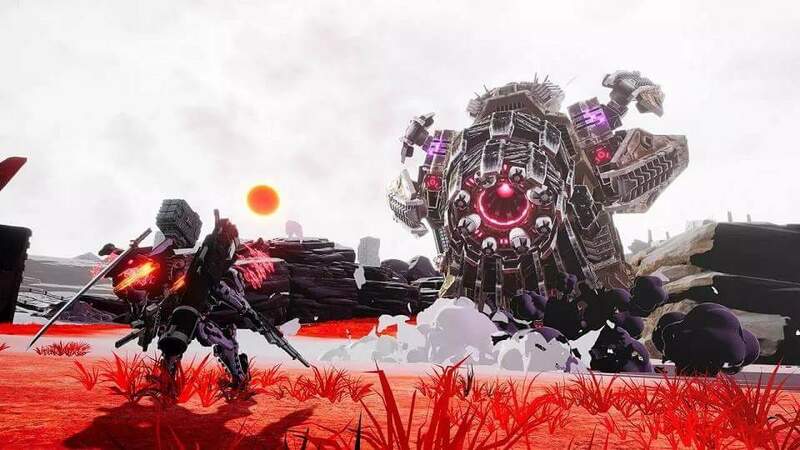 In the great deluge of news from this year’s E3, you may not have had a chance to dive deep into some of the more unassuming titles. 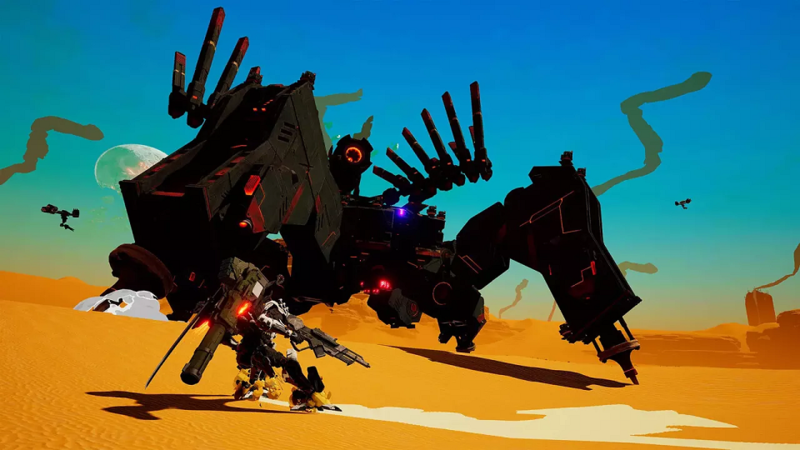 Marvelous’ Daemon X Machina didn’t receive a ten-part showing on the Treehouse show floor, and it isn’t a hotly anticipated sequel, or a startlingly unconventional indie title. 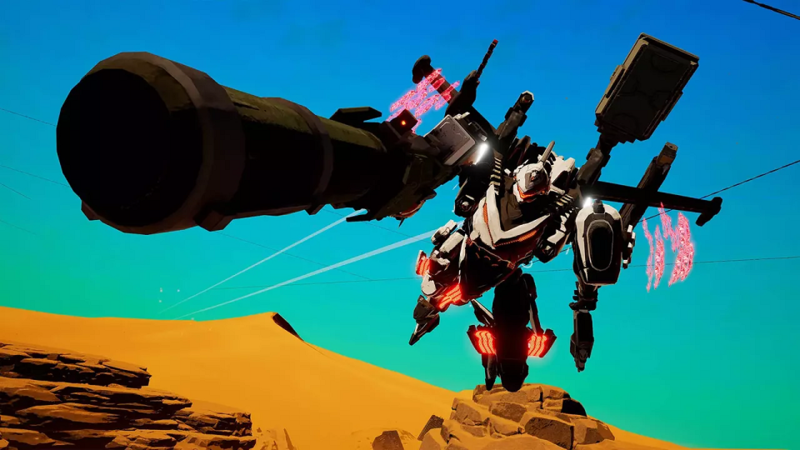 What it is is a beautifully colored mech action game coming out in 2019, produced by Tsukada Kenichiro (of Armored Core fame), and published by Nintendo. Kozaki Yusuke will be the character designer (Fire Emblem Awakening, Fire Emblem Fates), and Kawamori Shoji will be handling mech design (Armored Core; Super Dimension Fortress Macross). If you know your Japanese game developers half as well as you know your Pokemon, these names are likely to make you pretty excited. Daemon X Machina centers around missions that you can complete alone or with friends. 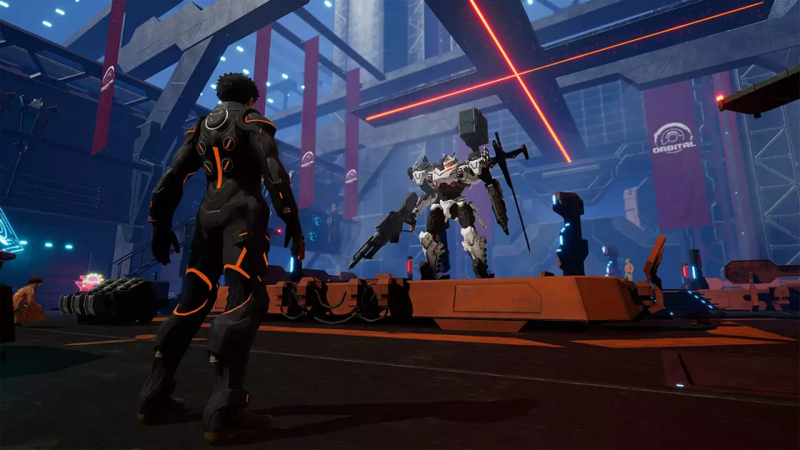 After creating a custom avatar, changing the usual hair, makeup, face, and other minutia, the player can explore their mercenary base. This hub world is where you’ll take care of customizing your mech, doing some shopping, or getting a relatively cheap nose job. You can admire your “Arsenal” (or “mech”) as you walk around, and admire your arsenal too, as your guns are displayed around the hangar. If you’ve got friends along for the ride, their “Arsenals” will be on display as well. Once you’ve equipped your primary left and right weapons, your shoulder-mounted equipment, and you back-ups, you’re ready to go. Two missions were shown during Nintendo’s Treehouse Live, which covers everything I’m writing here with the added bonus of being a visual and aural experience. The first, the original training mission in which your avatar must prove him or herself (male and female options are available) as capable of piloting an Arsenal. No doubt this includes proving yourself capable of wielding an arsenal, but I digress. The first thing I noticed when seeing footage of the game was the striking shadows, and how they contrasted with the bright palette of the rest of the world. Producer Tsukada Kenichiro explained that their goal is to use color to express emotion, and by coordinating colors elicit and illustrate feeling. Sometimes, he shared, this means stages with no color at all. Comparing the screens showed of other stages, the difference is something to behold. One suggests deeply blue skies, while another’s is indeed devoid of color. In the demo the Treehouse showed, oppressive crimson skies were used with the intent of creating a sense of dread, that something was coming. And something did indeed, but more on that in a minute. 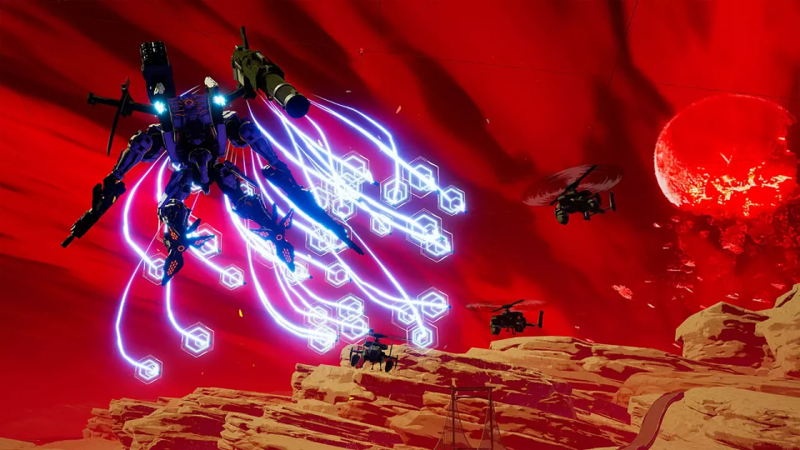 Unlike other some mech games, Daemon X Machina’s Arsenals are agile. They can fly over the battlefield, or skate around on the ground. With three different weapons you can fire at any given time, plus a couple more on your back that you can swap to on the fly, your options are never limited. They’re even expanded by the environment. In the Treehouse footage, you can see the player topple buildings onto foes, crushing them, and throwing vehicles at distant enemies. Those vehicles can be shot in midair to become a fairly effective form of C4. Of course, you can also pluck road signs. Even cooler, if you go up to the side of a building, you can sometimes pull out a metal beam, like it was somebody’s spine in Doom, toppling the building and providing you with a rather sweet melee weapon. Tsukada stresses that players will be able to take their enemies’ weapons from their chunky metal corpses (which we’re told have no people inside- they are driven by an AI menace called the Arms of Immortals). If somebody has a sword you want, no problem. Drop them with a couple missiles and your Arsenal can expand its arsenal. You can use your new weapon right then and their, allowing you to adapt your combat at any time, or you can take your weapon back home with you, to save for a loadout that might have more use for it. Naturally, you can even display it in your base. Exploring the stages from both the air and on the ground sounds to be worthwhile. While details were mostly scarce on what kind of secrets you’ll find, Tsukada did explain that graffiti on the sides of buildings can be collected, giving you more colors with which to customize your Arsenal. At the very end of the Treehouse livestream, we even saw the player exit their mech after completion of the mission (you’re given about thirty seconds to pick up anything you might have missed before you’re sent back to base). We’re told some things can be found in this way as well. In the second mission, the player was joined by two AI team members hailing from the mercenary group. Not to be confused with the enemy AI, Arms of Immortals. If you recall, that foreboding something lying in wait I mentioned previously comes to bear here. An enormous robot is an intimidating spectacle when framed by blood red skies. The boss fired out missiles (which could be shot out of the sky) and swung a mighty sword that might make Soul Caliber’s Nightmare blush. Get too close, and the giant will grab your Arsenal right out of the sky and chuck him across the stage. While it wasn’t displayed in the Treehouse segment, we’re told you can land on top of the boss as well, and strike him from there. Ultimately, your mercenary group’s ace pilots fly in and finish off the giant, giving the player their mission complete screen, complete with money earned and items collected. At this point, story details are light. We know you’re a mercenary working for a group with other mercenaries. I would venture that you’re a rookie. The Arms of Immortals that you’re fighting live by hacking other machines, and seem rather bent on destroying humanity, who has evacuated underground. These sound like handy ways of keeping the ESRB rating down, as well as explaining why you can destroy entire cities without being a bad guy. Fragments of the moon have crashed down onto the planet, and their power is being used to fuel your Arsenals. No doubt why the moon has fallen apart, and the power it provides, will play roles in the story at large. We’ve still got a lot of questions, particularly about how the co-op is going to work, but from what we’ve seen, we can get a pretty good idea of how the moment to moment and mission to mission gameplay is going to work. I’m eager to see more of how their colors are going to elicit feeling, if only because they’re so striking. If you haven’t already, be sure to check out the game’s E3 trailer. If you’ve got the half-hour to spare, I’d recommend checking out the Treehouse segment as well. 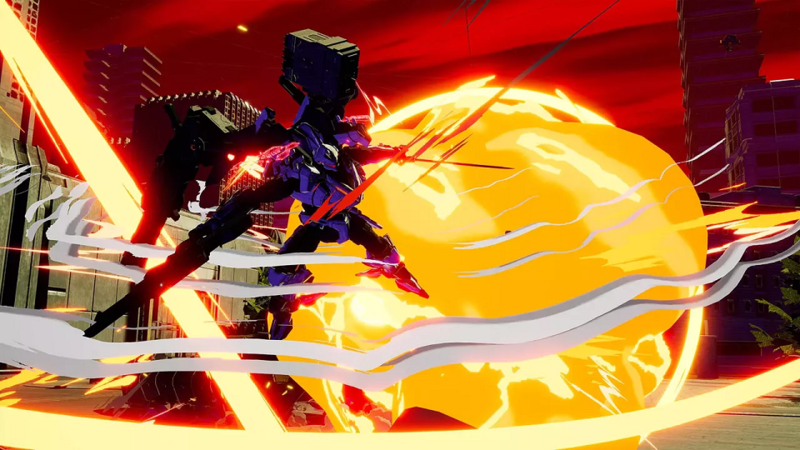 Daemon X Machina will launch in 2019, exclusively for the Nintendo Switch. Previous Episode 41: We Still Have Nothing But E3 News!